Last night, we saw the Gordon Hayward we expected to be getting when he joined the Boston Celtics the summer before last. Sure, he's still got a ways to go, and producing nights like last's consistently will likely determine just how far the Celtics get in their postseason play, but with so many ups and downs in recent weeks shaking the foundation of what Danny Ainge has been building, it's great to see the roots are firmly planted. While the tilt against the Philadelphia 76ers was but a mere regular season meeting, it may very well be a preview of a second-round (or later) matchup in the 2019 NBA Playoffs in the East; after having sacrificed nearly all of their depth and much of their remaining post-Process warchest to bring on Tobias Harris, many thought the 76ers were the team to beat (and perhaps they still are); having a surging Hayward coming off the bench, however, showed the importance of a well-rounded rotation as much as it did Gordon's newly-regained abilities. Gordon Hayward’s 6 3-pointers tied a career-high. 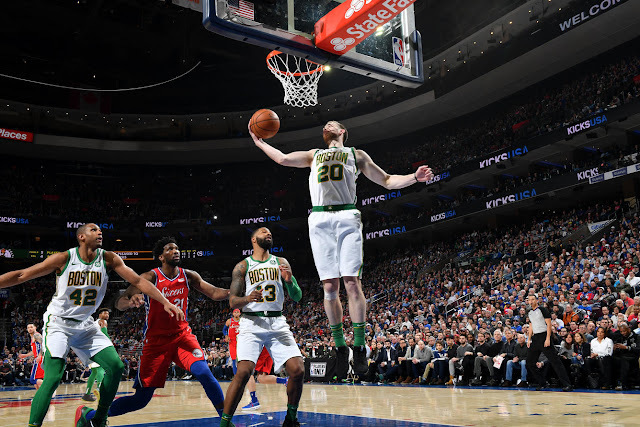 For Hayward's part, he put in a near-career night, tying a career-high six three-pointers on just seven attempts, going eight of 11 overall and four of four from the stripe for a total of 26 points, with four boards, three dishes and a steal for good measure. As I said, this is the Gordon we were hoping for, and it couldn't have come on a better night, with Kyrie Irving and Aron Baynes out healing up their recently-stressed lower extremities. With just tonight's matchup against the Detroit Pistons awaiting before some scheduled rest for most of the team with All-Star Week arriving, players should be able to recoup their health and energy entering into the final third of the season, where we will hopefully see continued progress from Hayward and the team in general.